A lot of students and teachers are nearing the beginning of summer vacation, which means no school, days full of adventure and relaxation, and nothing to worry about. But some people are already looking into the future for the upcoming 2018-2019 school year. Catherine Gray, founder and director of Na’atik Language and Culture Institute in Felipe Carrillo Puerto, Mexico, is one of those people. Catherine, along with the rest of the Na’atik team, is working hard to open the doors (quite literally) for a reading and learning culture in the Maya community where they are based. 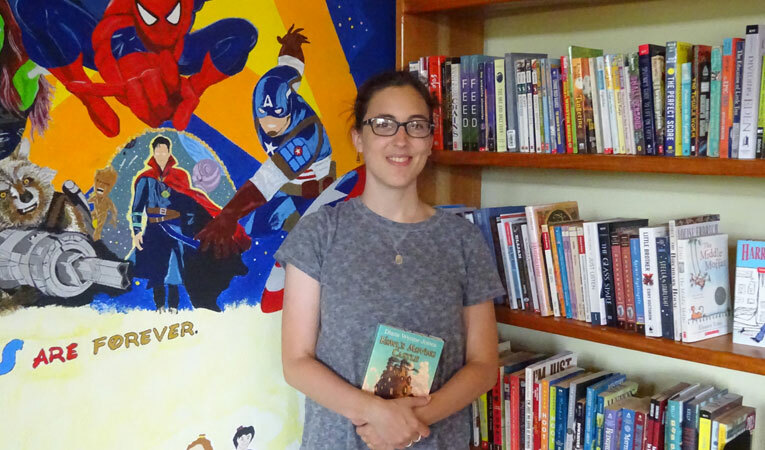 Read more about what inspired the founding of Na’atik, their language library project, and why they need your help to bring access to a librarian for the community in our interview with Catherine below. What inspired you to create and establish the Na’atik Language and Culture Institute? Founding a language school was something I never imagined I would do. I’m a teacher at heart. Before Na’atik, I had been teaching English and was an academic and retention advisor at the local university in Carrillo Puerto for 10 years. Most of my students were from Maya communities and were the first generation getting higher education. I loved teaching there but realized I was ready for a change. I thought about how amazing it would be to start an intercultural language school. English for the locals and Spanish or Maya for foreigners. There was a real need for English classes in town and I loved the thought of welcoming travelers and students from abroad interested in getting off the beaten path. I knew this would be a boost to the community too. I saw the possibility of creating a real and meaningful exchange of culture and language and knew this would bring so much to the local community and foreigners, as well as to me and my family. The name Na’atik comes from the Maya expression “To’on Na’atik” which means “we’re understanding each other.” That is a beautiful sentiment; how do you believe individuals build understanding with other individuals and the world around them? This understanding of each other is something that is built organically on a daily basis here. Each and every day, there are cultural exchanges with students, staff, homestay families, storekeepers, etc., the list goes on. We have students from Carrillo Puerto interacting with their foreign English-speaking teachers in and out of the classroom; students from abroad interacting with and learning from their Carrillo-born Spanish teachers and their homestay families. Our staff is a mix of foreigners and locals, which requires continual cultural understanding regarding things as simple as how to run a meeting and how to plan an event. Our homestay families are constantly trying to understand how to have a welcoming, comfortable home for their international students, while the foreign students are trying to learn about their homestay families to make conversation and learn about the culture they’re immersed in. The understanding is built because all of the players want to understand each other. Seeing the connections form and grow, we know that “to’on na’atik” is really happening. Why do you believe it is important to develop this understanding between individuals, languages, and cultures? I honestly believe that most of the problems around the world occur because people simply don’t understand each other’s cultures. Cultural and language misunderstandings can cause problems through hurt feelings or damaged pride, which can cause people to feel insulted or not listened to. I’m still on this journey of understanding this culture – even after 20 years living here with my locally-born and raised husband. The cultural differences are vast and even the subtlest miscommunications can turn into huge issues. But once this understanding is gained, it is amazing how things can function well. My experience learning about this Maya-Mexican culture has also made me very aware of the need to understand all cultures and realize not only the importance, but the necessity, to understand a culture before judging or questioning actions or beliefs. 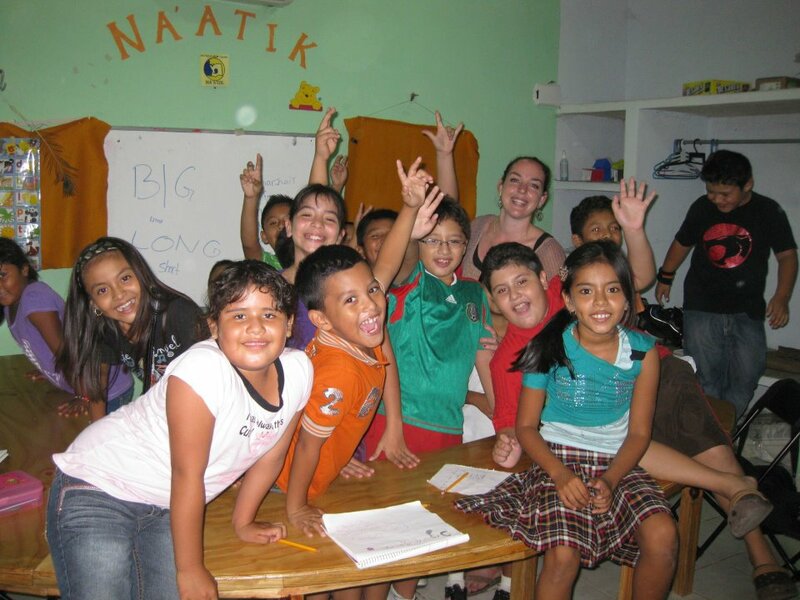 How does Na’atik serve the community of Felipe Carrillo Puerto? I feel like Na’atik has had an impact in Carrillo in both a social and economic way. The fact that our English teachers are kind, open people from native English-speaking countries, the town has learned that not all foreigners are arrogant and ‘better’ than they are – an unfortunate attitude that is common here. There’s a certain amount of pride that having foreigners want to learn their language, eat their food, and learn about their culture. Students gain a confidence and realize that they can be friends with people from other countries and share the same interests. I see students proud to know people from around the world and feel they understand differences between the cultures. Our English language students are following their dreams and are gaining the confidence to leave here to study in schools in other cities. On an economic level, the school has brought jobs to the community as our staff continues to grow. Our homestay family program not only provides additional income to the families, but the families’ children are also learning English for either free or at a discount. Additionally, the foreign students are spending money at local shops, restaurants, and on locally-run tours and activities. What will the presence of a fully functioning library and a full-time librarian do for the community? My number one hope is that the library, with its full-time librarian, will bring the love of reading to Carrillo where the students learn how awesome it is to get lost in a book. The librarian will work closely with the English language teachers to (hopefully!) instill this love of books, and to work with the students so they also learn the art of researching and writing – something that isn’t taught in schools locally. The library, and its librarian, will also work with the students in their language development. In order to spell and write well, one has to read. Creative and analytical writing is not a part of the curriculum here, and another goal of having a librarian is to teach the students story and essay writing. I hope our students gain these skills and once they start reading. Through all of these additional resources, their English language skills will flourish. Another goal is for the students to also seek out books in Spanish to read so they will improve their Spanish literacy and writing skills. How do you hope to impact the community? Education is slowly becoming a priority here in the community and my intention is to keep up this momentum. I hope to continue motivating the students to read and learn. It is our goal for the community to see that learning English, reading, as well as dedicating time both in and out of the classroom, brings long-term benefits in higher education and getting good jobs. Strong English skills are getting students into good schools, graduate programs, exchange programs, and good jobs. Having a library and a librarian will reinforce what students are learning in class and will open their minds to so much more. Ready to Bring a Librarian to the Na’atik? Connect #NiñosConLibros Today! Previous StoryWhat’s a Library Without a Librarian? Next StoryInnovation in Philanthropy Winner: Pangea Publishing!